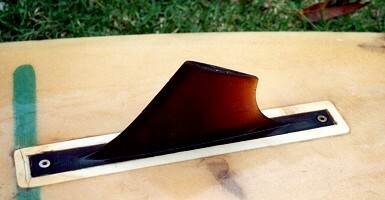 Bottom: Slighty rounded hull -light Vee around fin to tail. See images left and below. - black text , left of forward sweet spot. Bottom: DROUYN - multi-coloured spray paint on blank , large. Deck: Clear with volan rail lap. Bottom : Clear with volan rail lap. 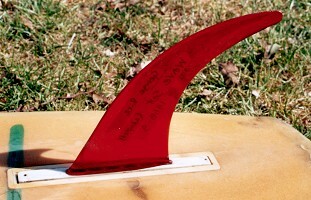 Waveset fin box and fin base. Sustitute fin to fit Waveset finbox. Obtained from council cleanup, Ocean Avenue, Wonoona, NSW. The deck has many fractures, dings, staining.and major delamination at the tail. This is largely due to the extreme light weight glassing. The bottom has several minor dings and a chips out of the nose and tail. 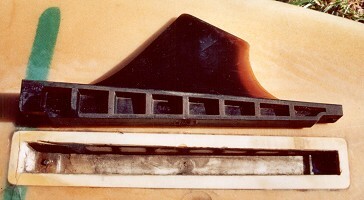 The fin is broken and the finbox has cracks. A radical design of the period (-note the light weight) from a noted surfer shaper. Note - The entry excludes Peter Drouyn's win at Makaha in 1971, howerver it is listed in the entry for the Makaha International Surfing championships, page 358. 1967 May The Hot Generation Paul Witzig. 1967 High on a Cool Wave, Bob Evans. 1973 Drouyn Bob Evans - note that all Bob Evans films, many others featuring Peter Drouyn are not available on video/DVD. Pacific Longboarder Magazine, Volume 1 Number 3 1997. Pages 26 to 39. 2. Tim Baker : Too Long In Exile... Peter Drouyn. Deep Magazine, Issue 10, Autum 1997. Pages 14 to 21, and 67. I like your site and have looked at it more times than many...i am a big fan of Australian surfing history and live up near Byron. I have been working on a story on Drouyn and... to be fair...how come his 1970 makaha win isnt on your site....or his 1970 Aust titles?? Or his second in the bells 4 times/? or second at the smirnoff? - can only find Bell's 2nd for 1971, 1974 and 1977. - until I am satisfied that my work on the period 1900-1915 is complete, other areas with be dealt with as required. Deep Magazine, Issue 10, Autum 1997 Pages 14 to 21, and 67. Just interested, cas doing the research...i mean drouyn isnt on surfline either....or surf info...its bizarre?? Did he shag lots of peoples sisters or something?? By focusing my work on surfboards, I have attempted to avoid the cult of personality. If Drouyn has been underestimated by the media, he is certainly not the only one. Some claims in PLB article noted above are contentious, others simply unverifiable. Bob Evan's Drouyn, 1973, would hardly indicate a lack of media exposure. I have recently accessed a Peter Drouyn surfboard, circa 1969. Catalogue entry currently in preparation, some already uploaded. Any comments on this board are welcome. * Name withheld at writer's request.